Flank steak was once a neglected piece of meat. It’s true that this muscular cut isn’t always as tender as other cuts, but it packs unbeatable flavor and is certainly worth a try. With this recipe, you simply marinate it, rub it with a bold spice mix, then baste it with a Whiskey Barbecue Sauce, made from the marinade itself — the beefy flavor will still come through strong. 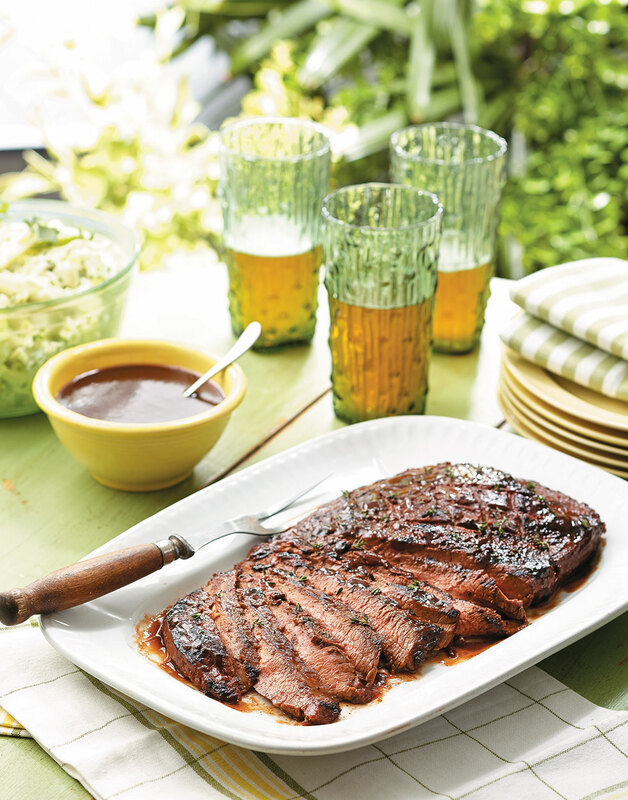 This glazed BBQ Flank Steak isn’t just grilled steak — it's true barbecue fare. Prepare the BBQ sauce before you begin grilling. Basting the steak merges the flavors of the sauce and the spice mix. Plus it provides an appetizing glaze. For the marinade, combine cola, pineapple juice, vinegar, whiskey, brown sugar, garlic, ginger, and Worcestershire in a 9×13-inch baking dish. Score steak and place in marinade, turning to coat. Cover dish and chill at least 2 hours, turning halfway through. Remove steak from dish, reserving marinade for Whiskey Cola BBQ sauce. Lightly pat steak dry. Preheat grill to high. Brush grill grate with oil. For the spice rub, combine paprika, thyme, salt, granulated garlic, cayenne, and black pepper; rub onto steak. For the sauce, boil reserved marinade, ketchup, onion, and jalapeño in a suacepan over high heat until thick, about 30 minutes. Strain sauce and discard solids before basting and serving. Grill steak about 6 minutes, then flip and baste with Whiskey Cola BBQ sauce. Grill steak 5 minutes more, then flip and baste again; grill 1 minute more for medium-rare. Let steak rest 5 minutes before slicing against the grain. Serve steak with remaining Whiskey Cola BBQ sauce. Make the marinade more effective by cutting a very shallow diamond pattern into the steak. The meat needs to marinate at least 2 hours to be tender and flavorful, but after 4 hours it may get mushy. To create a powerful Whiskey Cola BBQ Sauce, reduce the leftover marinade to concentrate its flavors.